I figured I'd start this post off with the picture I took of our Dream House! There were about 52 other runner-ups, since every home in Charleston had me swooning. The Southern charm was everywhere you looked: the flickering lanterns, the Spanish moss dripping from the trees and swaying in the breeze, the beautiful flower boxes on every window and the sound of the horse hooves on the cobblestone streets. I'll take all of it. This post is going up a bit late since we went to Charleston back in October, but better late than never! It was amazing how much was still in bloom everywhere and how warm the weather was. It was definitely an atmosphere we could get used to. Patrick and I have been talking about the possibility of moving to Charleston for the past year so we wanted to see as much of the city as we possibly could in 3 days. We stayed at the Belmond Charleston Place, which was an absolutely beautiful and pet-friendly hotel- we were so excited to be able to take Chloe with us! In the mornings we'd grab coffees and walk from our hotel to Waterfront Park, walking along the water all the way down to White Point Gardens to finish our coffees on the benches beneath the Spanish moss-covered trees and watch the boats sail by. It was just as beautiful as it sounds and I miss those mornings every day. Then, we'd wind our way through The Battery (the southern tip of Charleston that has the most beautiful homes!) and every so often we'd hear horse hooves coming down the streets. It was absolutely charming. We also spent a lot of time walking up and down King Street (the main drag where all the retail shops and restaurants are). One of the places we stopped in was called Pancito & Lefty's that had THE best Mexican tacos, not to mention an all-white and industrial decor that I loved. Amen Street - we met up with some friends who live locally and had an amazing dinner here: complete with hushpuppies, fried green tomatoes and the freshest seafood. Husk - the food was incredible and it's located in a traditional Southern home with the double front porch and everything. So beautiful! The Ordinary - I highly recommend the 'Air Mail' cocktail which was white rum, lime, honey and sparking rose. The atmosphere here is also so beautiful, the building used to be an old bank. 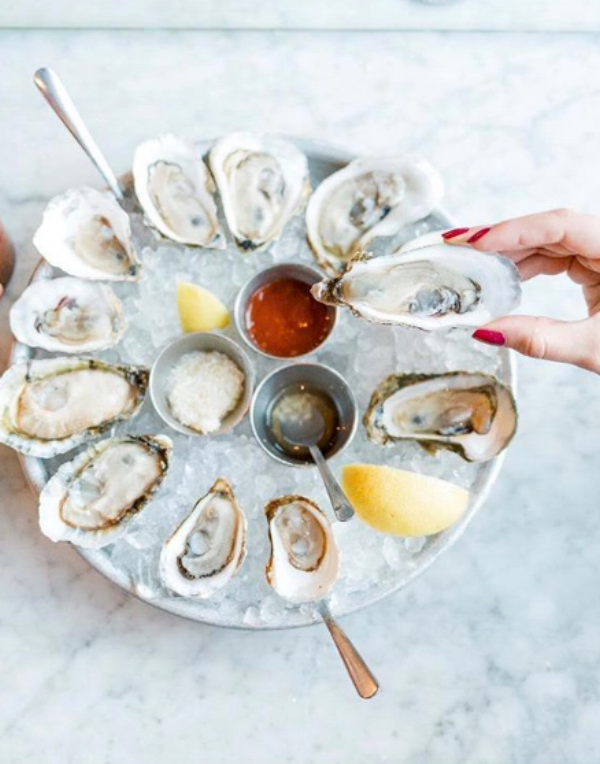 The Darling Oyster Bar - this is your place if you're craving fresh Raw Bar! On our last day, we drove to Sullivan's Island to check out the beach. There were so many dogs running around and everyone said hello as they walked by (in New York, where I'm originally from, everyone usually keeps their head down to avoid eye contact). It was so friendly and refreshing and such a beautiful view! Afterward, we stopped for brunch at The Obstinate Daughter, which turned out to be another absolutely delicious spot! We have plans to go back to Charleston in the spring and I'm counting down the days! There are so many more streets to explore and restaurants to try and an exciting decision to be made about possibly calling the Holy City our future home.